Free Step 2 Toys! 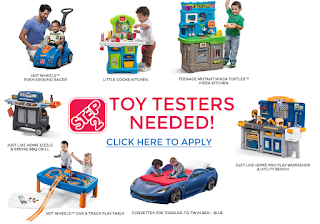 Become A Step 2 Toys Product Tester. Step 2 is looking for people to test out their toys. They will ship you the toys free of charge and you will test them out and provide feedback. You must apply before midnight 4/11. They will email you at a later date if you are accepted, not everyone will be accepted.